Moderate clustering short-stemmed rattan to 10 m tall, usually less; stems without sheaths to 20 mm diam., with sheaths to 40 mm diam., internodes c. 8 cm long. Sheaths of a very thick texture, dull to bright yellowish-brown, covered in reflexed triangular black-tipped spines to 3 cm long, and abundant black scales; knee present but only slightly swollen, armed along the mid line with a row of reflexed spines continuing up the petiole. 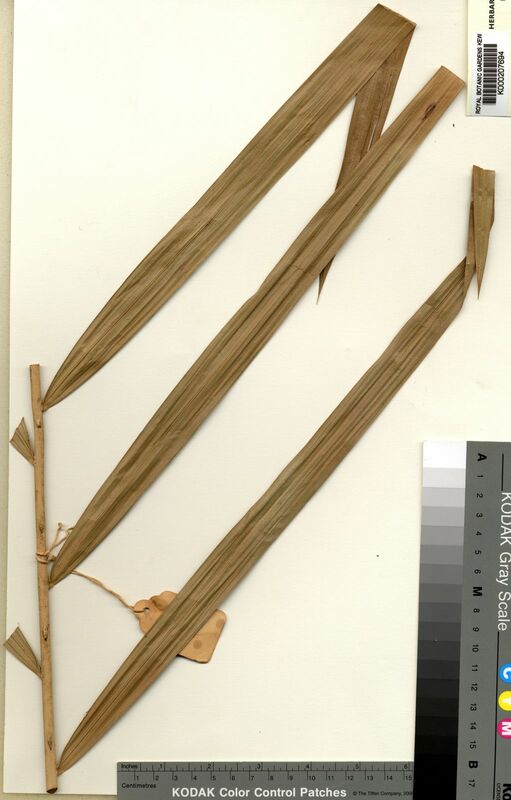 Leaf cirrate to 2 m including the cirrus to 75 cm and petiole to 40 cm; petiole yellowish green armed laterally with ± regularly arranged bulbous-based horizontal or slightly reflexed spines to 2 cm; leaflets acuminate, very stiff and coriaceous, up to 15 on each side of the rachis, regular but distant, the longest at the base to 50 × 2 cm, decreasing to 28 × 2 cm near the tip, slightly plicate, unarmed but with short distant teeth along the margins, transverse veinlets conspicuous. Inflorescences to 50 cm long; bracts to 25 × 5 cm, pale brown, extremely tough and almost woody; 1st order branches c. 5, in the female up to 10 cm long; secondary bracts inconspicuous. Mature fruit very large, to 2 × 2.5-2.8 cm, distinctly oblate, shortly beaked, pale green to ivory-coloured when fresh, straw-coloured on drying, covered in 20-24 vertical rows of scales. Seed dull brown, oblate, to 1 × 2.2 cm; sarcotesta sweet; endosperm deeply ruminate. Seedling leaf not known. (Fig. 24). Known from a few collections from kerangas in Temburong and Belait Districts. Elsewhere in Sarawak (4th and 5th Divisions) and Sabah. Endemic to Borneo.